Which is the best for applying to lateral analyst positions? Should I include a short summary in my CV if I will apply for a spring internship? I have a question regarding Investment Banking Analyst resume. I might have a potential entry into IB through networking but my background has been in Audit and Reporting (I am a CPA). 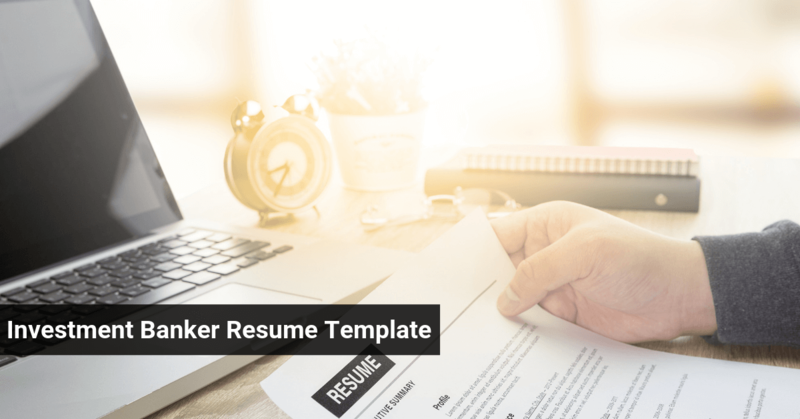 I am trying to tailor my resume and am wondering which template to use.I have looked at quite a few templates including the ones on this website and was thinking of using something similar to the template in this article. What template would you recommend? I have been out of school for a while and I am experienced. Then you should use this template. Really, the template doesn’t matter that much; the most important point is how you present your work experience and spin it to sound deal-related. At some level, GPA becomes less important. No one really cares about an MD’s GPA if he’s bringing in $10 billion deals on a regular basis. Two years into the job, GPA still matters to some extent, so you probably need to keep it. I am an economist (Ph.D.) who has been working in finance for the past three years. Mainly in risk (market, credit, etc.). I am interested in perusing a career in IB. As a career changer I would appreciate your advice given my background. Hello! I was just wondering about a gpa roundup question, I know there is an article on it, but wanted some more assurance. I have a 3.48, is it okay to round this up to a 3.5? At my institution the finance club and everyone seems to always tell me, NEVER round up or round GPA? Can you please provide me with your thoughts and what you think of this? Thanks! Yes. If people claim that you cannot round up a 3.48 to a 3.5, these people have mental problems or are trying to sabotage you. If the bank wants your full transcript, let them ask for it… no one will spend more than 300 milliseconds thinking about why you rounded a 3.48 up to a 3.5. I have been working in a financial consulting for past 8 years and have recently completed my law. Law had always been my forte and finance my passion. Now i want to break into M&A or IB. What kind of roles can I go for? And how do I approach this? I have currently been working for the past 2years for one of the major oil and gas companies and now looking to move into the finance world. I am looking at utilising my experiencing of the industry to provide some technical expertise to aid investment decisions. I am unsure where to start looking ? Would you recommend that i undertake an MBA to pursue this career path? Your best bet is to reach out to such teams and see if they want more of a finance background first. I have seen some of your videos and i have really enjoyed learning new things. I am currently in my final year of engineering from india and i wish to pursue a career in finance field. I have given few exams side by side and have undergone few courses in financial field. I would really like to seek your opinion on 2 things. 1. How should I present my resume for a financial firm as i am a fresher and with have only the basic knowledge of the field. 2. Does masters in finance require any prerequisites. I am currently a M&A analyst but we have not closed a single deal since i joined last year. The furthest in the M&A process was only to write an information memorandum. I have also did market research, company profiling, 2 pitchbooks, teasers, 1-2 models and several comps. I would like to seek your opinion on how I should write my experience in my role as it seems sketchy. I’d just say something around the lines of “Conducted market research, drafted pitch books, prepared information memorandum, and built financial analyses such as [DCF, public comp]” I would not worry about not closing a single deal as long as you can talk about what you’ve done. First and foremost – thanks for your help in the past. Your prep materials had helped me land an EMEA IB internship with a bulge bracket bank in 2012 which I converted to a full time starting in 2014. Prior to IB, I did my MBA from a tier I European school. Another reason for moving to buy-side is that I also eventually hope to move on from a purely financial role to an operational role where I can help improve performance of portfolio companies. In your vast experience, is this something you have seen happening often? What impediments do you think I would face in achieving this objective. 1. Maybe position each pitch as a “pending deal” and describe the transaction rationale but act like the deal started and then never went anywhere. That sounds a bit better than just admitting they were pure pitches. 2. Yes, just describe the industry and give a rough revenue or market cap for each company. 3. For PE, M&A is definitely preferred. But if you have only IPOs, you’ll probably have to use at least 1-2 IPOs. But see if you can include M&A pitches and position them as “pending deals” as well. Sometimes people move into operational roles, but companies will be skeptical if you’ve never had operating experience before, and they might not be sure what level to bring you in at… so you should try to get *some* type of operational experience, even if it’s informal/consulting-type work or advising a friend’s company or something, before you move. Thanks for the insights and experience sharing. I am from Hong Kong and currently a dealer of both local securities and global futures. I have just over 8 years of experience in local securities and just around 6 months for global futures. Also I have over 10 years of trading my own stocks. My education background include a Master in Accountancy and MBA and studying for the CPA as well. My current job have some exposure in writing research reports (mainly daily market reviews) using Bloomberg and other channels. I am very much interested to become Equity Research Analyst. Your insights gives me some hints and it would be great if you can provide some more specific hits for my specific situation. – Is there a way to make audit work Project-centric? Before Big 4 I used to work as a Business Analyst and it’s quite easy to quantify what I did. I’m struggling with audit though beyond standard ‘carrying out audit from planning to completion’. Also, should I include something on the clients I’ve audited? I’m in asset Management, so I’ve worked on BlackRock, UBS etc but I’m not sure if I can mention them by name? 1) Yes, you can just write about specific clients you worked with. But you’d have to pick more unusual engagements or ones where something out of the ordinary happened or they would ll look too similar. Yes, definitely mention clients you’ve audited and leave out the names if you write something sensitive about them. 2) If you have enough experience to list CFA after your name, list it at the top; otherwise include it in your section at the bottom on Skills and Interests. Thanks a lot for your help Brian! Hello, looking to break into IB from the S&T side (specifically FX sales). I can spin specific client examples into “deals,” but is it okay to actually mention the client’s name? Or do I just mention “Fortune 500 Company” then explain what I did? Thanks! If it is not confidential yes you can include the client’s name. Thanks for the article, very helpful indeed! I’m looking to break into IB from a China angle. British 22 year old, Business undergrad first class degree, no solid finance we, currently studying a masters in International Business in China (studying in Mandarin medium- conversationally fluent in Chinese Mandarin). Any thoughts on how I could play my ‘China card’ to land a IB job? If you’re looking to work somewhere else such as HK, your knowledge of the language could be helpful but to be honest they’ll almost always prefer local candidates. So the best way to use that background is probably to return home and use it to sell yourself as “more interesting” and someone who can work with Chinese / other Asian investors interested in acquiring companies and assets in Europe. 2. My professional experience is related to trade and investment development, with some degree of due diligence involved. I would greatly appreciate your input and feedback. Yes I’d include such projects. Hi, I am working as assistant controller for a Private Equity firm and interested in switching to deal side. I have no investment banking experience and my employer only hires experienced associates. Any suggestion how to convince my current employer to change my role or apply for positions at other PE or Transaction Advisory firms? I saw the FAQ regarding (gulp) GPA rounding, but wanted someone to weigh in on more specific situation – have 1 more semester left, and given classes, GPA should easily be 3.5 (3.45+ then rounded) upon graduation. However, recruiting is before semester will end, and current GPA is 3.401. Would it be unethical/wrong/too risky to write GPA as 3.5? Tough one. If you’re certain you’ll get a 3.5 I’d write Expected GPA: 3.5 For the application, you can still fill in 3.5 but it can be risky if they ask you for documentations at this stage. However I wouldn’t worry too much about it for now. A 3.5 may prevent you from getting dinged, though there’s a slight risk. Thanks, Nicole. Wanted to update – just double-checked, and GPA is actually 3.41. A little closer to the 3.45 I need, may make it more acceptable to round. In my experience, few places ask for transcript to verify. Looking at only the banks that don’t request transcripts, they won’t verify GPA during background checks? That depends. I can’t say. 0.1 isn’t a big difference so I wouldn’t worry too much about it, though there’s a risk this may come up. Hi, With a BSc in computer science and a masters degree in IT with innovation and Management Studies, coupled with 3 years work experience in retail, IT and charity industry. How do u suggest i break into the technology section of an investment bank. Also which particular CV type and Cover letter format do you advise I use because i noticed none of the ones you posted has an executive summary. I’d apply online and email hiring managers of technology divisions at banks. You can still use our template format for technology roles. We don’t recommend clients using executive summaries on their resumes to preserve space (unless you have 10 years+ of experience); your work experience should give people a snapshot of your past, without needing to insert a summary section. In most cases you can use your cover letter to give them a snapshot of your skills. Hi I am a recently graduated (September 2012) in mechanical engineering and I have started working immediately after graduating in an engineering consulting firm. I work as a technical advisor on Project Finance transactions. Although many of my clients are investment banks, I don’t have the actual experience they look for (financial modelling, etc.). I have been applying to tier 1 IB for a year now, and never got an interview! On the other hand, when I apply to engineering companies (blue chip) I often get an interview. Therefore my skill set must not be that bad. Do you have any advice for me? I am trying very hard to get a position in IB (M&A, ECM or Project/Acquisition Finance), sending applications practically every day. I am considering doing an MSc in Finance or an MBA (the latter will have to be at least next year due to the 3+ yrs experience requirement), but would these qualifications secure me a position in IB? Will I be too old? Have I missed the boat? I regret not have applied to internships when at Uni. Good news Nicole, I have an interview with Rothschild! 1. Can someone get into IB/PF/HF without any, ZERO, financial modeling experience? I am more than willing to learn the skill but need some guidance on what to read or maybe look into a good book. Till then I am curious to know if I can break into this space. BACKGROUND: An IT Business Systems Analyst who has done a lot of management and technology consulting for Banks and Software firms. I currently make $90k base + benefits. 1. I think you maybe able to land an internship at a 2nd/3rd tier IB/PE/HF without finance experience with lots of hard work and the right positioning. However, getting a job at an IB/PE/HF, especially as a credible firm, can be more challenging because you’ll be competing against many candidates who have had solid experience (yes financial modeling experience too) in this area. What you can do is to network a lot, and hone your modeling skills. The articles below should help! I am an Engineering Graduate currently working in IT industry. Am very much interested in a career in Invest Banking but i don’t have any relevent experience. How can i work for this? or is it mandatory to have MBA for such a career? Thanks for this – very useful! Quick question: at what point is it OK for your CV to spill over 1 page? When you have > 8 years of experience. It will still be good to have an abbreviated version of your version then too. I’m working at a bulge bracket through a temp agency and want to update my resume. On my resume, I would rather list the BB as my employer even though technically I’m employed by the temp agency. Do you think this is something I could get away with? Are you working for the bulge bracket then? What are you doing for them?